Why would a line about growing a beard induce hearty laughter followed by tremendous applause? Think "Beauty and the Beast." The concept has been made and reworked in movies, on the small screen, and on stages across the country where memorable lyrics and choreography from Disney's 1991 animated version inspired humming and sing-a-long standards. Before opting for a version that continues the 'princess' tradition (if it's not broken, don't touch it), the company considered a beast centered POV. They wisely jettisoned that concept, opting for a longer, flamboyant harmonious mix of live action and digital CGI where often its score crescendos with Busby Berkley flair. "Beauty," of course, revolves around the familiar look beyond appearance when searching for love. It maintains similar prince/princess happy endings of "Cinderella," "Snow White," and "Sleeping Beauty,"which all surround love, so add "Frozen" to the list for its sisterly emphasis. Belle (Emma Watson), who allows herself to be imprisoned in the horned furry creature's castle as a replacement for her dad, has a zesty , strong willed , independent spirit. It's shown in the village where she has earned a bookworm label and branded her unconventional for wanting to teach other girls to read. She resists the Beast's (Dan Stevens) come eat dinner demands, which allows the enchanted tea cup, clock , candelabra, and other once inanimate objects to display their quirky traits. Ironically, the reading passion later becomes a connection spark in the castle library. Director Bill Condon has a background in horror ("Gods and Monsters," "Strange Behavior") and musicals ("Chicago," "Dreamgirls"), as well as the two part "Twilight Breaking Dawn" franchise entry. An exquisite choice for a musical monster movie he embraces elaborate design, derivative colors, and perfect fluidity suggesting a nod to the animated classic which likely will see a boast in sales and rentals. Disbelief never overrides viewers. Call them spells or flirts with insanity, the bubbly, jamming "objects" contain personalities which break through the digital drawings to seamlessly blend with Belle, the Beast, and villagers. Songs move the story and lyrics relate to circumstances ("she did not shudder at my paw...," "she'll never leave me even as she fades from view," "be our guest.. be gentle, be kind..."). 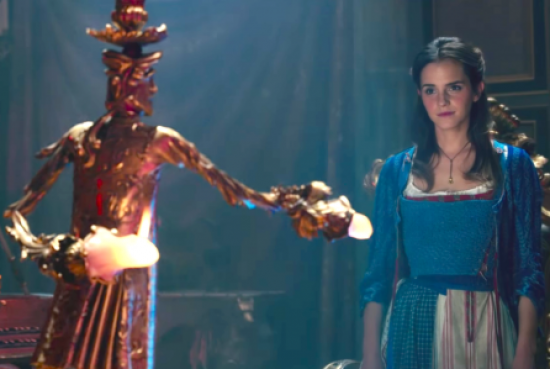 The mellow , show stopping "Beauty and the Beast" reprising generates the same "wow" as Frozen's "Let it Go." A "gay moment" leak caused a Georgia drive in to cancel the booking sight unseen. Unless you happen to be searching for the "moment," you'll likely miss this two second cut. You might more notice a continuity lapse. It's on screen more time than the other moment, which amounts to a minute cut of a dance pairing that has fascinated some zealous progressives pointing "there it is , there it is, oh, it's gone." The continuity lapse? Belle rides to the castle on a horse wearing dark boots. She does not tote an overnight bag or purse. Yet, on the library ladder and a scene thereafter she wears cork soled flats, just like during some earlier village scenes. Guess the magic mirror or the enchantress sent them to her! Our "she said" noted the power of love throughout as the theme, noting that a sincere kiss casts aside the punishment for non-compassionate, excessively self-loving conduct. One female critic did frown on the molding of 1990's 'girl power"and gender politics into a tale set in 18th Century France. Still, she agreed the controversial scene was a "blink." Agreeably , the best insert comes from a magical 'trip' to Belle's childhood which fills in a hole in the backstory. Condon and the cast earn kudos and other honors for their convincing abilities unwrapping the musical furniture and objects as strongly within the realistic realm, except we know this is an upbeat 'fairy tale' and rocking the castle will be not tolerated.